As Spring approaches, the number of enquiries I am receiving regarding closures and re-openings in the Grampians has increased. I am hoping to have some solid dates for this very shortly but, the indicators are good – aiming for a Spring re-opening in many of the areas. And first up, let me say that the response and care from the climbing community, of the closed areas has been impressive. And duly noted. For your interest please find the most recent update regarding climbing and bouldering areas following this article. What is also very obvious is that the popularity of bouldering continues to grow., and quite noticeably at that. While this is great for the sport, for encouraging people to get outdoors and get physical with nature, it also means that there will be more human traffic that the areas and tracks in have to deal with. And this is really where we need to work hard to get some mindsets in place with those using the areas now and also those that will come in the future. This is so important when it comes to the environmental impact that these areas will inevitably have to deal with. We should do everything we can to minimize it – for the sake of the environment we love to climb in and those that will come after us, and also for the continued access that we currently enjoy. I don’t believe that the land managers we currently deal with want to just blanket ban climbing and bouldering so that the issues don’t occur and it doesn’t have to be dealt with. I do believe though that some of the concerns they have around traffic levels and impact, especially in more sensitive areas, are real and deserve to be addressed thoughtfully. This does mean taking into account the rights we have as recreational users, but there are also a suite of other rights and park values that land managers are required to manage. The Grampians is a National Park and one of its main goals (and for those that manage it) is to conserve its environmental values. So anything that contributes to more human usage immediately will be a concern. It is also an area that contains the largest amount of cultural heritage sites and has a strong indigenous community attachment to it. Again – anything that contributes to more human usage has the possibility of hindering the preservation of these sites and therefore destroying precious indigenous history in the process. All of this must be taken into account when managing the park. Climbing and bouldering is now a very accepted form of recreational activity in the park, and for the most part, does not occur in visitor managed areas. Visitor managed areas = hardened surfaces, tracks etc.and budgets for staff and resources (minimal as they are!) And for climbers and boulderers – that probably sits a bit better for their experience. But if we want this, it also means we need to take on a role whereby we are constantly assessing our behavior and also the environment we are accessing. And when need be, we need to make adjustments – sometimes maybe even a little unpopular with others. I also believe that we can continue to engage in our recreational activity and still look after the environmental values of the park. As always, education is the key. And it’s not a one poster, one season kind of thing where the information gets put out there and that’s it. It’s a constant as new people continue to enter the sport. Harking back to the first sentence of the second paragraph – very obvious is that the popularity of bouldering continues to grow. New areas are being developed around the Grampians. Some are in areas that can handle the traffic and impact more, and others less so. Getting people to understand this and adjust their behavior willingly, I think, is the key to continued access over time. CliffCare will be working on an educational campaign around bouldering and I am hoping that individuals and climbing related businesses will provide feedback and help when needed. And yes, there will be some posters but more importantly the issues and how to address them is information that is so easily passed on from one person to another. In general conversation the fact that a particular area may be closed at a particular time, and why that might be so. Areas that don’t handle larger groups as well. Suggested behavior when you can see activity of the negative kind. This is the kind of education that has more chance of sinking in. There will be more of this over the coming months. Any thoughts you may have feel free to drop me a line, write a comment on the blog or facebook and just keep the dialogue going. Hoping that many of you manage to check this before you head off for the weekend. As I noted in the previous post, the main bouldering areas such as Andersons and Kindergarten are still closed but there have been a few new openings so check the post or download the official PV document uploaded to this site. As always, please remember that many of the sites that have been opened are still recovering from fire. Take care to stay on the designated tracks, avoid going in with large groups and be mindful of your packs and gear and try to keep them off the vegetation as much as possible. 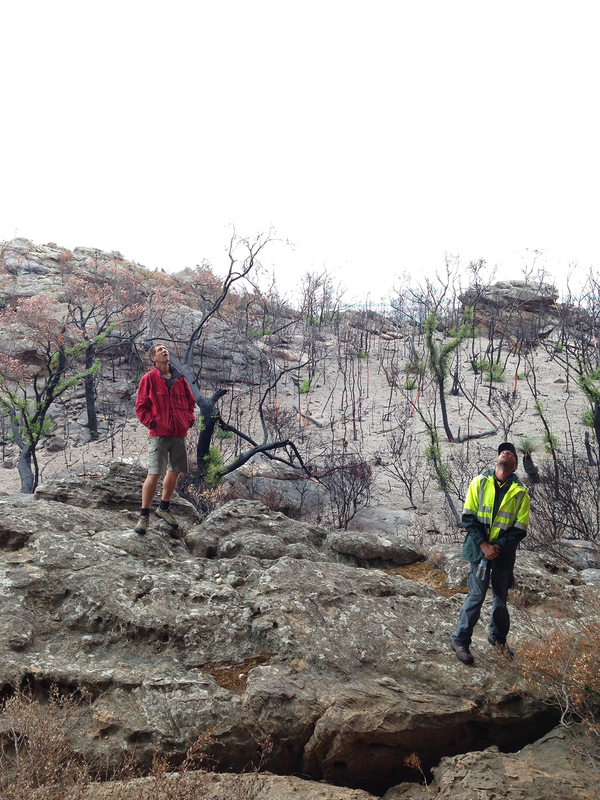 In January 2014 a large bushfire swept through the Northern Grampians causing widespread damage to visitor sites, roads and walking tracks. Many popular rock climbing and bouldering sites were also impacted including Hollow Mountain, Summerday Valley and Mt Stapylton. While three main visitor sites have since re-opened ( Flat Rock, Mt Stapylton return walk and Mt Zero), the majority of the Mt Difficult Range remains closed to visitation, this includes rockclimbing. Environmental recovery in the Northern Grampians has been slow – shallow soils and lack of rainfall has meant vegetation has taken longer to regenerate. 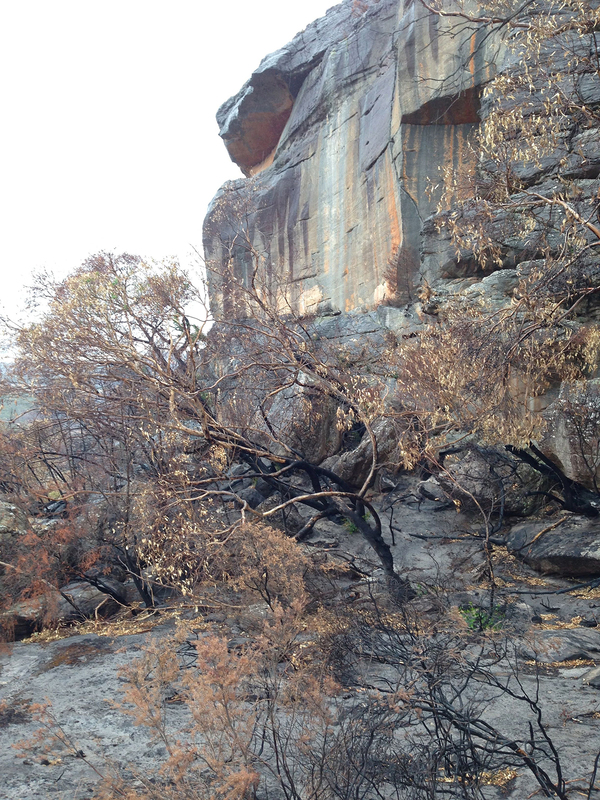 The landscape is still very fragile – Parks Victoria has been working closely with the local rock climbing community and CliffCare to ensure there has been a considered approach to re-opening rock climbing sites in the Northern Grampians, taking into account long term sustainability of climbing. Please support the long term recovery of fire affected areas by remaining out of any closed sites. *Hollow Mountain (Gun Buttress to Andersons), Farside, all climbing areas on the Northern Side of Stapylton (Van Dieman’s Land to Sandinista) and other climbing areas in the Mt Difficult Range such as Eastside, Pohlners and Smiths Rd remain closed. Summerday Valley is currently only accessible via Licensed Tour Operators and school groups. • The Black Range and Mt Talbot (west of the Grampians) remain closed due to fire. Stay on designated tracks – any off track walking can impact soil stability and the regeneration of vegetation. Spread of weeds and other pathogens can occur by foot traffic in fragile soils and recovering mossbeds. Don’t create short cuts or new tracks. Consider other options – There are many climbing and bouldering sites within the Grampians. 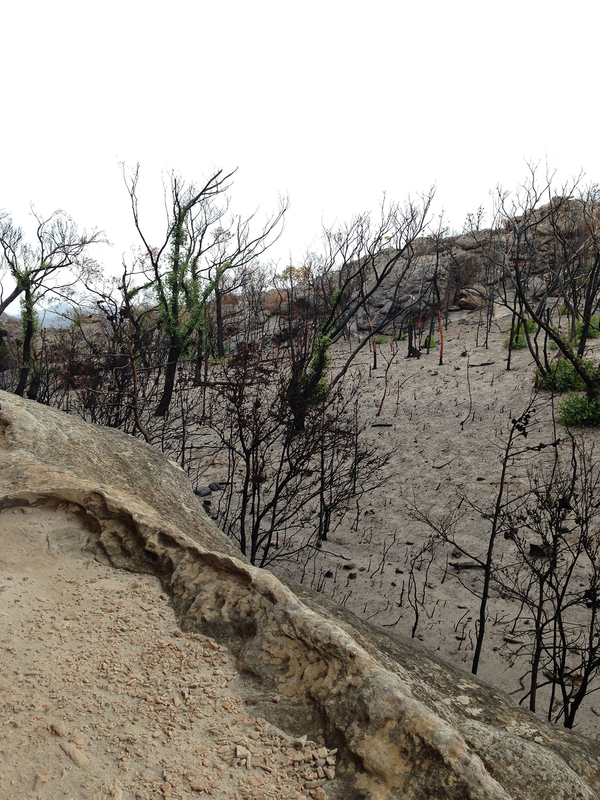 By giving these fire affected areas some time to recover they will be here to enjoy in the future. Only climb in open and accessible areas and keep group numbers low – Avoid taking large groups into area where there are no designated tracks. • Take your rubbish home with you. 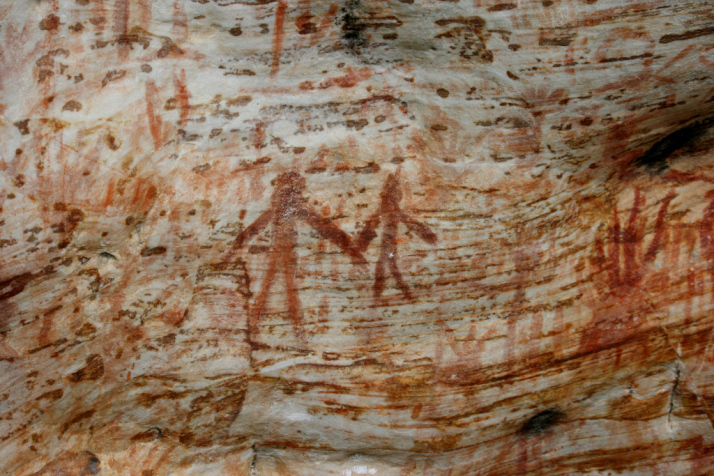 * Visit http://www.cliffcare.org.au/ for rock climbing access and environmental reports. books or websites. Please note park closures. 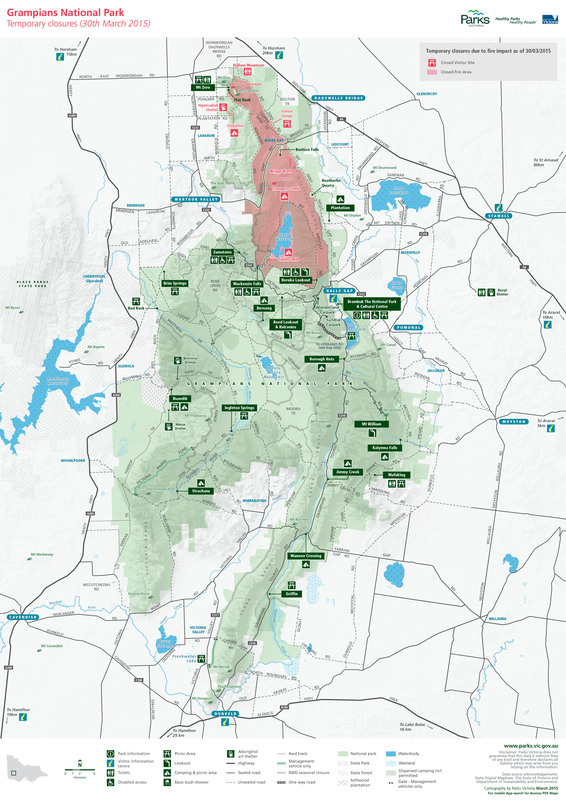 * The closest camping option in the National Park is Plantation Campground, approximately 10km north of Halls Gap, or private accommodation in the Northern Grampians area. Bush camping in closed fire affected areas is not appropriate. For updates on the many camping, walking and driving opportunities in the park, call into Brambuk, the National Park and Cultural Centre in Halls Gap, visit the local Visitor Information Centre or call Parks Victoria on 13 19 63. While Parks Victoria regrets the need to enforce closures, substantial fines will be imposed on those found in any closed, fire affected areas. 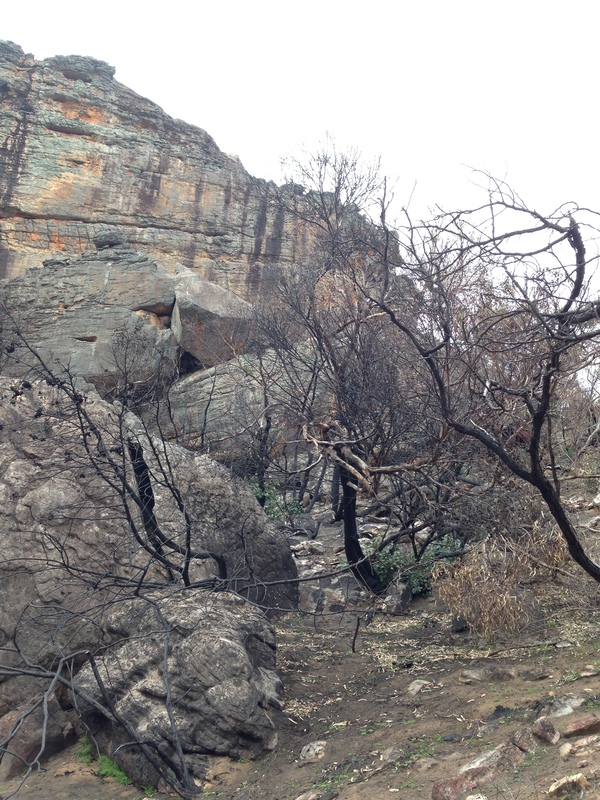 For fire recovery updates, maps and further information on activities, campgrounds and car touring options in the Grampians National Park please visit http://www.parks.vic.gov.au phone 13 1963 or call into Brambuk the National Park and Cultural Centre, Halls Gap, open 9am-5pm daily. Red Rocks Road closure – 5/5/14 – approx 2 weeks. Weirs Creek access. TEMPORARY (Due to road closures)– From the Henty Highway, take Andersons Road. Follow this all the way through to where it intersects with Red Rock Road. Park up here on Andersons Road not Red Rock Rd. This is closed so please respect this closure even though it may seem super easy to just park on it or drive a little way down. The Billimina Art Shelter was impacted by fire with the complete destruction of the timber boardwalk adjacent to the art site. In consultation with Traditional Owners, a replacement structure will be installed to provide access to the art site. Parks Victoria are currently discussing the type of structure to be installed with the potential to stone pave the area instead of a timber boardwalk to be more in keeping with the setting of the art site. They aim to have this site re-opened prior to Easter. Please note that the walk to Buandik Falls that follows part of the Billimina walking track is open (see below). The walking track to Buandik Falls has been re-opened following repairs to the pedestrian footbridge along the path. Plans are in place to repair and re-open Strachans Campground prior to Easter. Quotes are currently being obtained for the construction of a new toilet facility immediately adjacent to the campground, and for repairs and a subtle upgrade to the campground itself. The Chimney Pots walking track is open for to visitors. However the Chimney Pots Carpark is currently closed to allow some minor works to take place. Visitors are advised to park along the edge of Glenelg River Road or the entrance to the carpark. Please note that all other visitor sites, walking tracks and roads in the fire recovery area are open, except for Sawmill Track between Glenelg River Road and Victoria Range Track. This road will remain closed until Strachans Campground is repaired.